Tonight I discovered something amazing! 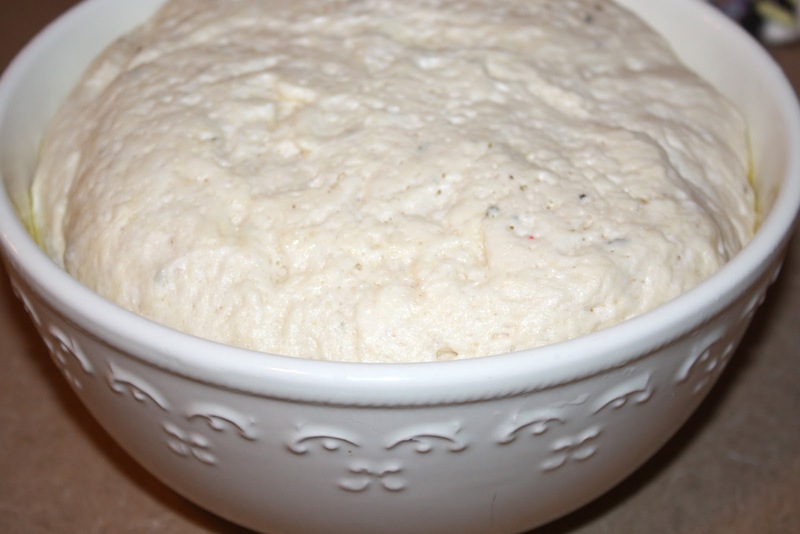 I finally found a homemade pizza dough recipe that is incredibly easy, fool proof, AND delicious! I feel like I’ve tried dozens of different recipes over the years and have never been impressed with any of them. I finally found a winner! Mixing the dough was very easy. In a bowl combine 1 1/8 cups of warm water, 3 teaspoons of active dry yeast, 1 1/2 tablespoons of honey, and 1 1/2 tablespoons of olive oil. Give it a stir and let it sit for ten minutes until bubbly. In a separate bowl combine 2 1/2 cups of flour, 1 teaspoon of salt, 1 teaspoon of garlic powder, and 1 teaspoon of dried basil. When the wet mixture is bubbling combine all the ingredients and knead for several minutes with the dough attachment on your mixer, or by hand. For me it came together into a perfect ball very quickly without having to add any extra flour or liquid. Then you just drizzle a little olive oil in a bowl, roll the dough to coat it with oil, and place plastic wrap over the entire thing. Let it rise for an hour and a half. I was amazed by how quickly it rose. I could have easily been ready to use it in an hour or less. The best part about this dough is how incredibly easily it covered my pan! That seems to always be the most frustrating part about making your own pizza. It’s nearly impossible to stretch it out to the size you want. I didn’t have an ounce of difficultly with this one. It was perfect! Next, preheat your oven to 375 degrees. Then melt 2 teaspoons of butter with 2 cloves of minced garlic and brush it over the dough. I saved a little of the butter mixture to add in the final minutes of cooking. Finally, put the dough in the oven by itself for ten minutes. Take it out and cover it with your favorite pizza toppings. Tonight I made my favorite – BBQ Chicken. I used honey bbq sauce, diced chicken left over from last night, two slices of bacon, Italian and cheddar cheeses, and dried cilantro. Then put the pizza back in the oven for about ten minutes or until the crust looks done. The original recipe called for an additional 3 tablespoons of butter and 2 tablespoons of Parmesan cheese to be brushed over the crust edges during cooking to make it into an actual garlic bread crust. 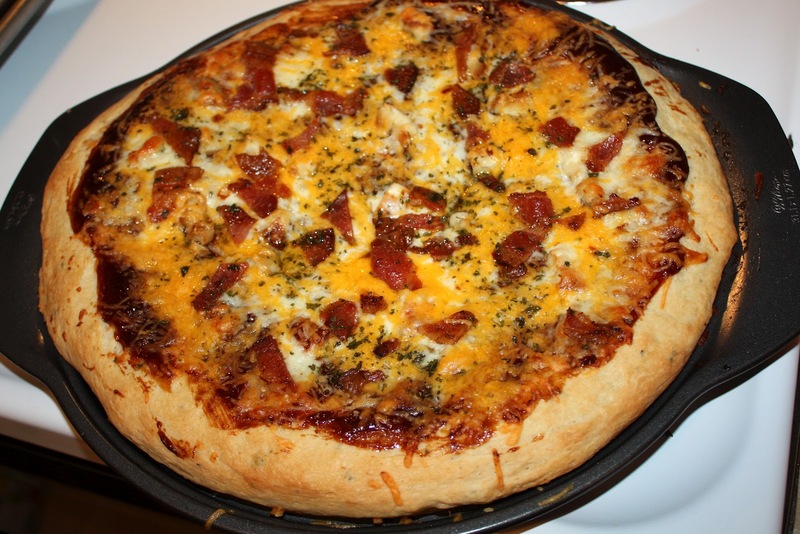 I might try this next time if I make a more traditionally topped pizza. It seemed a bit much for my bbq flavors tonight. There you go! 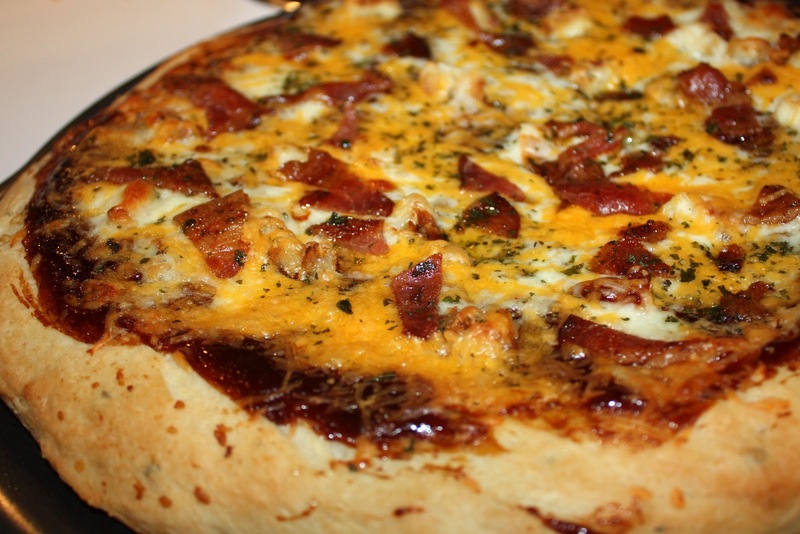 A super easy, fast, and yummy pizza crust recipe to make at home! Combine wet ingredients, stir, let rest for ten minutes. Combine dry ingredients and mix everything together. Knead for several minutes and then place in an oiled bowl, covered in plastic wrap, for an hour to an hour and a half. 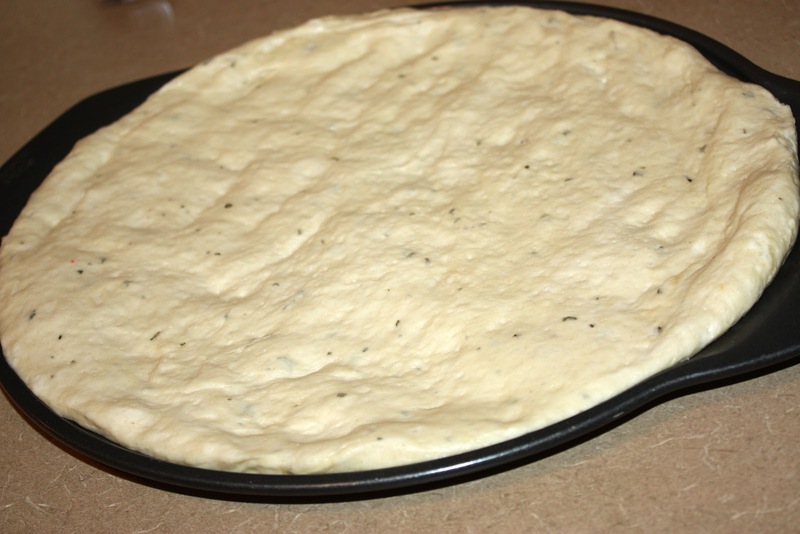 Spread crust over greased pizza pan. Top with melted butter and garlic. Bake at 375 for ten minutes. 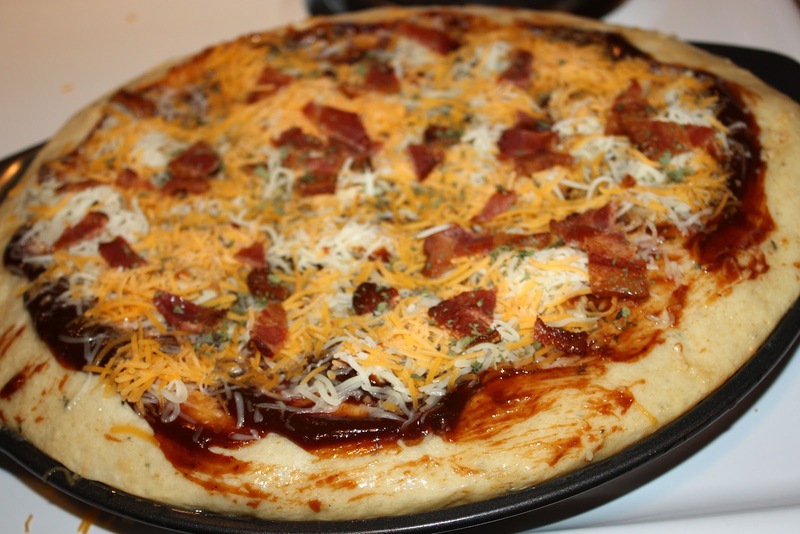 Put topping on pizza and brush additional butter and garlic mixture over crust. Bake for another ten minutes or so until it looks done. Enjoy! Next Next post: Good Deals at Target!